Die klassische Verbindung aus Holz und Metall lässt keinen Zweifel daran aufkommen, dass sich der Besitzer einer S 404 Classic zu den Werten des traditionellen Waffenbaus bekennt. Der ErgoLux-Holzschaft in Holzklasse 2 minimiert mit dem nach hinten ansteigenden Schaftrücken den gefühlten Rückstoß deutlich. Durch die optimierte Schaftbacke hat der Schütze noch mehr Kontakt zum Gewehr. 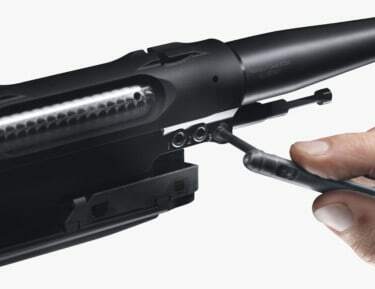 The modular system of the S 404 allows for the change of stock and barrel within a split second. Using the Sauer SUS universal key which is an onboard folding allen key integrated in the S 404’s detachable fore-end sling swivel, you can easily and quickly exchange calibres and stocks according to your needs. Meeting your friends after hunting – do I leave the rifle in the car? Danger ahead? Not with the S 404. In just two simple steps the bolt head can be separated from the bolt body. Firing the rifle therefore is totally impossible. Changing the bolt head for different calibres is just as safe and easy. This means: safety and modularity are combined the smart way. The ergonomically perfect manual cocikng system of the S 404 provides comfortable and silent cocking. By simply pressing the button with the thumb, the cocking slide silently slides back into the uncocked position. 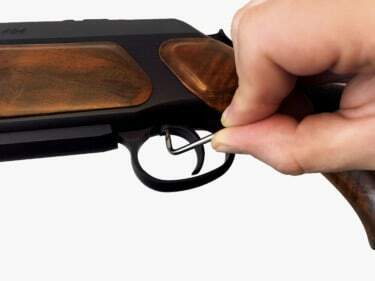 In order to open the bolt in uncocked position, simply tap the cocking slide. An adjustable trigger featuring four different trigger pull weights that are individually adjustable, is the perfect answer to the physiological effect chain of knowledge and acting. Crisp 550, 750, 1 000 or 1,250 g (1.2, 1.6, 2.2 or 2.7 lb) leave no doubts that your S 404 is programmed for success already prior to taking your shot. Every successful competition shooter knows: Only the optimum position of the shooting finger on the trigger blade provides proper trigger pull and controlled shooting without the risk of missing the target. With an 8 mm (0.3˝ ) adjustment range for length of pull and a left-to-right swivel range of 5 degrees, the S 404’s extra-wide trigger blade guarantees each shooter optimal contact to reliably hit the target. Magnum: 7 mm Rem. Mag., .300 Win. Mag., 8x68 S, 10,3x68 Mag., 10,3x60R, .375 H&H Mag.